A valid, signed US passport. The passport must have at least 6 months remaining after the completion of your stay in Ghana, and contain at least one blank visa page. Copy of round trip airline tickets or itinerary, or letter of confirmation from travel agent. COPY OF AIRLINE TICKET OR E TICKET (for single entry only) – ticket must be purchased before a visa can be issued. 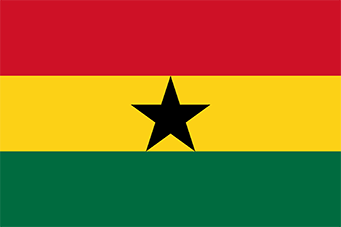 Application for persons under eighteen (UNDER AGE 18) requirements : a copy of their birth certificate, color copies of their parents’/guardians’ ID, and a letter from their guardians/parents giving their permission for the minor to travel to Ghana. Copy of round trip airline tickets or itinerary, or letter of confirmation from travel agent. This is required for single visas only, not for multiple visas. LETTER OF INVITATION FROM INVITING ORGANIZATION– Required from sponsoring Ghanaian entity on its letterhead. b. NON-RUSH MULTIPLE VISA – $100 – Multiple visits – Please allow 10 business days processing time. Note we are closed Fri, Sat and Sun. VALIDITY: Multiple entry visas are valid for 3 years unless the passport expires within the 3-year period. Ghanaians by birth are entitled to a multiple visa that is valid for 5 years unless the passport expires within the 5-year period. There is no requirement to purchase your ticket before requesting a multiple visa. Your application will be hand carried to the Consulate, and is usually processed in 24 hours at the consulate for Rush Service.